The Polycom RealPresence Group Convene delivers a rich video, audio and content experience for small groups and individual collaboration. This flexible system works together with the Polycom RealPresence Group 310 or the Group 500, allowing you to deploy the right solution dependent upon the specific needs of each room or workspace. 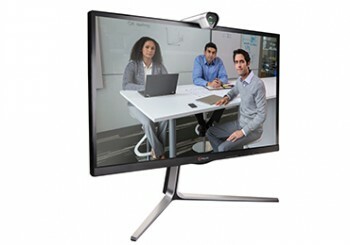 With the Polycom RealPresence Group Convene, you can choose from single or dual-displays and have the option of great collaboration features such as built-in multipoint, HD PTZ cameras and a selection of mounting options, making the group convene a powerful video collaboration solution optimised to work with any space you wish. The Polycom RealPresence Group Convene is an attractive and easy way to extend collaboration into the small meeting space and huddle room – wherever people gather. The included tabletop stand and optional wall mount ensures optimal placement so that everyone in the meeting can be easily and clearly heard and seen, wherever they stand. It design and flexibility also makes it perfect for personal collaboration from the desktop, given users a dedicated solution, designed for the highest qualiyt video, audio and content collaboration. With an integrated HD display providing a wide viewing angle, and the powerful integrated audio we have come to expect from a Polycom solution, the RealPresence Group Convene provides crisp video quality whilst ensuring everyone is heard in full clarity. Finely tuned to maximise the performance of the RealPresence Group Series, you get a best-in-class experience including 1080p60 video and content, whilst gaining access to native Lync 2013 interoperability, a simple and intuitive interface and the ability to extend the benefits of your Unified Communications platform to the desktop and huddle room. The RealPresence Group Convene: In more detail! The RealPresence Group Convene solution consists of two components: Your choice of RealPresence Group Series codec, either the Group 310 or Group 500, and the RealPresence Group Convene media accessory.